I was one of those people who was hooked on Minecraft early on. I played a lot of Simcity in my day, and I’m always fascinated by games that have put the effort into simulating not just the game but the operation of the game. In the past, games like Evil Genius, where you legitimately issue orders rather than simply doing everything yourself, have eaten MONTHS of my free time. 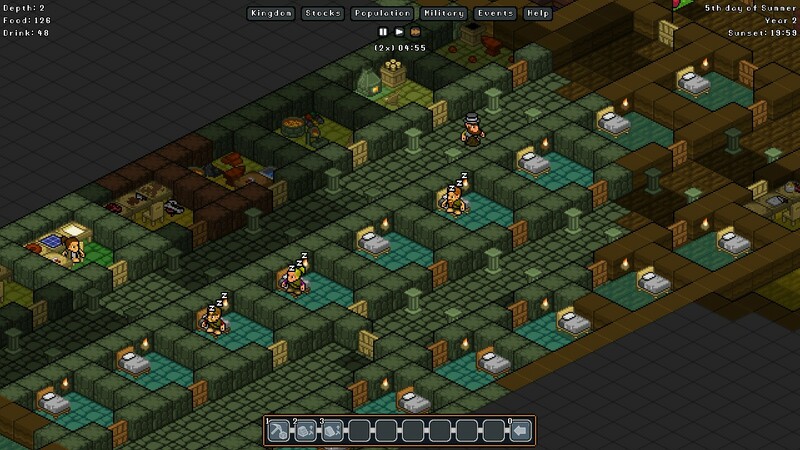 Gnomoria is the new scourge of my off hours, a simulation sandbox game no doubt destined to swallow most of the next few weeks before I can break its grip on me. It’s fairly standard to use “retro” visuals for games where most of the work is going to be devoted to a deep and detailed engine, if only for the simple reason that there is only so much money go to around. As you’ll see in the extremely long gameplay section, this is a deep simulation, and thus the graphics are relatively simple. They are attractive and sufficient, but there is nothing groundbreaking. I’ll say that plenty of work has been put into giving you the same amount of control over the visual options as you have over the gameplay options, so invisible squares can be blocked out or invisible walls can be half or full, and the HUD can be visible or hidden depending on your taste. You can even change the uniforms of your gnomes! Everyone gets their own room in MY kingdom. The best way I can explain the gameplay of Gnomoria is Minecraft if you are playing as the supervisor to a team instead of playing directly. You begin with enough supplies to get you roughly through a season, and from there your job is to survive and thrive. I’ll be honest. I had a very difficult time getting into this game. It is a phenomenally complex game, and there is nothing within the game that acts as anything resembling a tutorial. I watched the intro video made by the developers themselves, then dug through the wiki, and still I had to burn through two different attempts at creating kingdoms before I finally internalized enough of the game’s mechanics to make it work. The basic game is as follows. You are presented with a randomly generated piece of land which stretches up to the sky and down into the bowels of the earth. From time to time enemies will attack and need to be fended off, and at other times new residents (gnomads) will come to bolster your ranks, or merchants will come to do trade. Your goal is to survive. The tools available to achieve this goal are endless, both in manipulating the game and manipulating the world. Every aspect of your kingdom is yours to manipulate, from assigning personal quarters to crafting whole new professions. There is a technology chain starting with “crude workbench” and working its way up to a machine shop, and your gnomes are staggeringly good at making your orders work. Let’s say, for example, you want to make a merchant stall so that you can barter. To do this, you’ll need a workshop and a few other tools like a sawmill as well as the requisite resources. Now, a merchant stall requires tables and chairs to build it. In other games I’ve played, (Like the recent Darkout) that means you’d need to first craft the table, then craft the chair, and finally craft the stall. Here, if you say build a stall, tables and chairs are automatically added to the build queue. Since those things need planks and sticks, those are added too. As a result, so long as you’ve got enough of the base resources and the right intermediate tools, they gnomes will work out the build order and get it done. Let's do some wheeling and dealing. Everything is simulated in this game, and thus there is a tremendous amount to keep in mind. Yaks breed and need to be fed. Workers need to eat, drink, and sleep, and they need to do so more frequently if they are working hard. It is a lot to keep track of, and the game lets you micromanage it to the Nth degree. As a result, it is extremely difficult to get a complete understanding of what needs to be done at any given moment, and it is very easy to tie the game in knots trying to be efficient. Important things like food and drink stores are recorded in the corner of the screen, but it is remarkably simple to lose track of them as you are crafting necklaces and designing traps. More than once I took people off of distillery duty in order to focus on mining only to realize I was completely out of wine. Now and again, either as a result of periodic attack or digging too deep and not spreading light where it needs to go, you will find yourself fending off attackers, which adds in the combat aspect of the game. 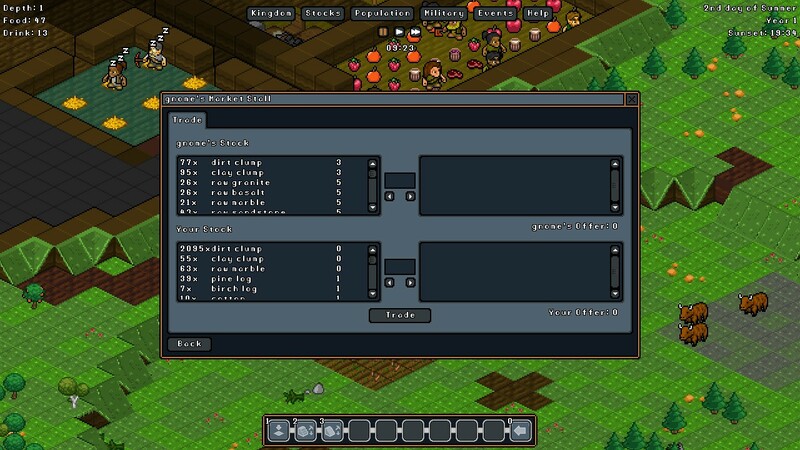 It is just as tightly managed as the rest of the game, allowing named squads that you can separately train and equip. If you devote enough time to researching at a tinkering table, you can build elaborate trap systems that have hatches, spring traps, mechanical walls, and automatic triggers. Though building traps that are safe for your guys but dangerous for the enemy is loads of fun, in the interest of full disclosure I’ll say that I set the game to “peaceful” for most of my review, because there is plenty enough to do without having to worry about unleashing golems from the underworld while looking for silver. I’ve rambled about the gameplay quite a bit, so let me close by saying that the cruelest trick this game played was actually rewarding you for making ridiculous superficial improvements. The value of your kingdom is what attracts new gnomads, and thus building yak bone statuettes in endless numbers until you can get some masterful ones to put in your Great Hall (which doubles their value) suddenly seem entirely sane once it nets you a few new workers at the beginning of the next season. If you’re like me, all of those poor ones you make in pursuit of perfection can be traded for wine and beer to make up for the distillery you’ve been neglecting in your focus on yak carving. Many ways to keep tabs on the many things. A friend of mine is a big fan of chiptunes. They are a distinctive brand of music, and in a game with SNES era visuals like this one, they are a perfect fit. For other people, chiptunes are just shy of nails on a blackboard and their era gave video game music bad name. This game has a catchy soundtrack, but more importantly, you can listen to it in “classic”, which is charming and retro, or in “orchestral” which is worlds different, sounding like a high quality midi arrangement of a classical piece. I personally listened to the orchestral version. It is impressive how much difference to the experience that little option can make. As this is in essence a sandbox game, and so the story is as up to you as the rest of the game. My intrepid band of gnomes were a batch of insane yak worshippers who left their old homeland in the hopes of creating a whole subterranean castle out of bones. Generally, when we do reviews here at BrainLazy, we play the games until we’ve had a representative sample of each part of gameplay, then write the review and move on. 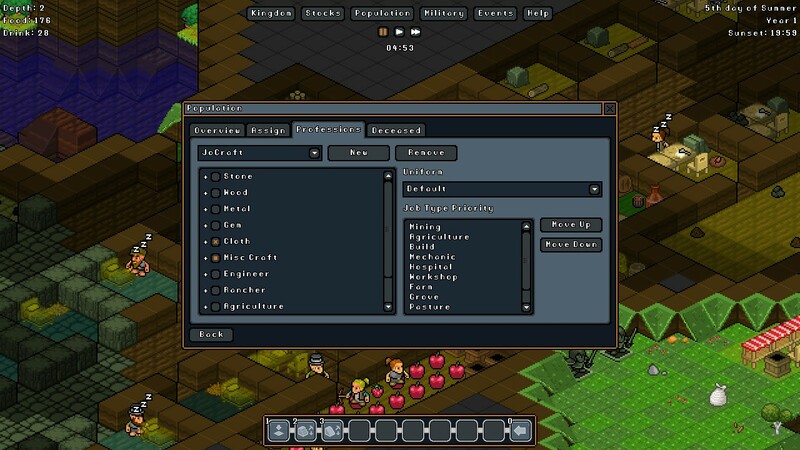 In the case of Gnomoria, I had a hard time writing the review due in equal parts to the fact that I both did not feel I’d experienced all the game has to offer and I didn’t want to stop playing it long enough to write the review. In all of the many, many hours I played this game, and many more where it was merrily playing itself while I did other things, I didn’t run into a single bug. The simulation is fantastic, and while I enjoyed it far more than the combat, the combat was good too. Due to its complexity there is a learning curve which might stop people at the door, but if you’re able to get past that, you’ll find a game that gives you almost every opportunity you could hope for and all of the information you might need to get it done. 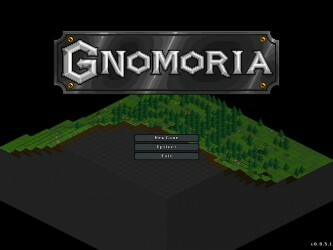 Gnomoria got its claws deep into my brain and fans of simulation, sandbox construction, or even real time strategy will find an addictive gem in this game. 9.6 / 10: Gnomoria is a stunningly complex and utterly addictive combination of Minecraft and Sim City which, despite its Early Access label is already a solid and enjoyable game.